Excuse me. Have I told you before that I am a serious pickle maniac? I have never met a dill pickle I didn’t love. You know Cookie Monster? I’m Pickle Monster. Salty, vinegary, crunchy P-i-i-i-i-i-i-i-i-i-i-i-i-i-ickles! While we’re at it and I’m confessing things, I should probably mention that I’m also devoted to dip. All dip. Creamy dips? Yes. Vegetable dips? Uh huh! Cheese dips? Gimme, please. Normally, I combine these two loves by dunking pickles in dip, and until last week that made me perfectly happy. Then I saw this on Pinterest. Dill Pickle Dip? What WAS this wonder? I had never heard of dill pickle dip. What was WRONG with me? How had I never thought of this? As lovely as the pickle dip looked on that link, I knew I’d be formulating my own. Her recipe called for cashews (soaked) and we have a rule about cashews here in our house. Namely, if they are here, they will be eaten all. by. themselves. Knowing that there was no way a dip that uses cashews in any form other than cashew shape would get made, I let inspiration take the reigns and went to town. I don’t go to town just to buy dip ingredients. Well, most of the time I don’t. This time I didn’t, because in addition to pickles, dip, and pretty socks, I also love cream cheese and that was what I was determined to use as the base for my dip. Why? Because cream cheese dips are the best dips in the world. Full stop. After whipping together a simple combination of pickles, cream cheese, pickle juice (YES! ), sweet onions (because pickles and onions and cream cheese are BFFs), dill and salt (because pickles, while salty, are not salty enough when stirred into cream cheese), the bowl was stashed in the refrigerator for an hour long rest just to let those flavours mingle. I grabbed a bag of my current best loved pretzels, pumpernickel and onion*, and sat down to inspect my handiwork. I dunked a pretzel, took a bite, and then I kind of blacked out a bit. I’m not sure what happened, but when I came to, the entire bowl of dip and bag of pretzels were empty. It’s crazy, isn’t it? *Pumpernickel and onion pretzels. Could you think of anything more tempting? I, for one, cannot. Thank you Snyder’s of Hanover for this wonder. And before you ask, Snyder’s of Hanover has no idea I’m writing this. They have no idea that I’m obsessed with their pretzels. They did not sponsor this post in any way. I’m just a big (and biggening) fan. I ♥ Snyder’s. Allow me to be Captain Obvious for a moment. This is a dip created by a pickle lover for pickle lovers. If you don’t like pickles you’re probably not going to love this. Conversely, if you love pickles, you will love this truly, madly and deeply. You can send me love notes. I’m okay with that. If you chop your pickles finely, you can get more dip on whatever you’re dunking. If you chop your pickles more coarsely, you get bigger bursts of pickle flavour. Chop accordingly. The more pickle juice you add, the less thick your dip will be. If you or someone you love is bonkers for pickles, do yourself or them a kindness. Make this dip, lay out a bowl of it alongside some sturdy chips or pretzels or crackers or vegetable sticks or a nice, polished spoon and feel the love. P.S. If you were to trip and fall and accidentally spread a little dill pickle dip on the bun for that nice hamburger you just made, you should probably go ahead and eat it. Again, I’ll just point out I’m okay with fan mail. This thick cream cheese dip chock full of dill pickle and sweet onion is for serious pickle fans! Dunk pretzels, vegetable sticks, crackers or chips in it or spread on a bun for a hamburger that'll knock your socks off! Use a wooden spoon to press into the cream cheese then stir until loosened up and smooth. Stir in all of the remaining ingredients until evenly distributed. Transfer to a serving dish and cover with plastic wrap. Refrigerate for at least an hour before serving. This dip is good for up to a week when stored tightly covered in the refrigerator. It may become thinner as the week draws to an end. Originally published on February 16, 2012. 1. I feel that you are holding out on me with the pumpernickel pretzels. 2. However, I find that I am feeling VERY forgiving with the advent of this pickle-cream cheese crack. 3. Supposing I was feeling lazy, would the dill pickle relish I made this summer be a suitable substitute for the chopped pickles? 4. (last one) in the absence of pretzels (I know!) will a spoon suffice? Holding out? HOW? And I’m glad you forgave me, because otherwise I wouldn’t share. 🙂 As for pickle relish, I think in a pinch, that would work, but there’s something nice about the bigger pieces of pickle in there like buried treasure (can you tell that I vote for the more coarsely chopped pickle option? )that makes it so texturally happy. And as for #4? YES. YES! I see that happening very soon, indeed! I just ran out of “Homemade Claussen Knock-Off Pickles” last week. I made 2.5 gallons of them last year, next year I am going to have to double that especially if you are going to keep giving more pickle uses. Perfect for finger sandwiches as a thick spread. I will make this with some corned beef and serve on cocktail rye and pumpernickel breads. Oh my. That just sounds incredible! I think that might just have a lovely place on the St. Patrick’s buffet table! Did somebody say “dill?” I’m a dill pickle lover too! Strange, because I can’t stand sweet pickles (sugar pickles as I like to call them). The dip looks awesome and even if I try to stay away from cream cheese, there’s NO way I could stay away from it if there’s pickle nestled inside! Pumpernickel/Onion pretzels – I must look for those in the store. As a native New Yorker, I fancy myself a pickle connoisseur – if you can put in Thousand Island why not cream cheese! I make a very similar dip with green olives and pimentos. Just swap the pickles for the olives and lose the onions. Yum! I made this for a potluck at work this week, everyone loved it, my husband has been eating the leftovers on pumpernickel bread, thanks for a great dip, I can’t wait to try it on burgers this summer! BLESS YOU for making a pickle dip!!!! I have a deep love for pickles and I am salivating as I type this. My husband on the other hand will not bless you, he actually gets irritated at the amount of pickles I eat. ha! So thank you for this recipe. I can’t wait to try it out! I think you could be my new best friend!! Pickles and Smartwool!! Maybe we were separated at birth? I have book club tomorrow night (Plan B by Pete Wilson). 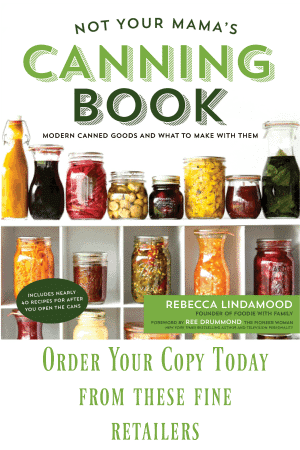 The book is green – it will match the dip! Thanks! It is chilling as we speak. If I eat it with a spoon, can I call it Dill Pickle Pudding? Major YUM! I had to be dragged kicking and screaming to fried dill pickles in Memphis. Once I was converted, trying the dill pickle soup at Polish Fest in Milwaukee was a piece of cake. I am a full pickle convert now and will try this dip. I have decided you cannot go wrong with pickles + fat. I was shocked when I read that you had never heard of dill pickle dip!! My son and myself LOVE dill pickle dip with Ripple chips. We generally buy the Philadelphia brand, but he will be so excited he can make it for himself! Thanks! I made this for a reception last night. I added garlic powder and that was the only change I made. This was a HUGE hit! Thank you for the recipe. What brand of pickles did you use? Ok…made this for “girls weekend at the lake” and I used my homemade pickles (also your recipe) and it was a hit. I even bought the pumpernickel and onion pretzels….FANTASTIC!!! I came home yesterday and my husband ate almost a whole quart of the homemade pickles himself. I will be making these every year….thanks!!! 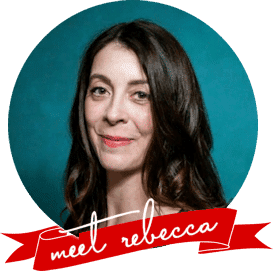 Rebecca, I just left you a review over at TK. I love this recipe! I can’t wait to serve it to my guests!!! Sounds delish. May I make a suggestion? I would give an extra step, but I would marinade the chopped sweet onion in the pickle juice or a little cooking sherry for 15 minutes before adding to cream cheese mixture. Just an idea. If you love pickles there’s a place in Brooklyn called “The Pickle Guy”. He has over 10 types of pickles and pickled vegies and fruit. 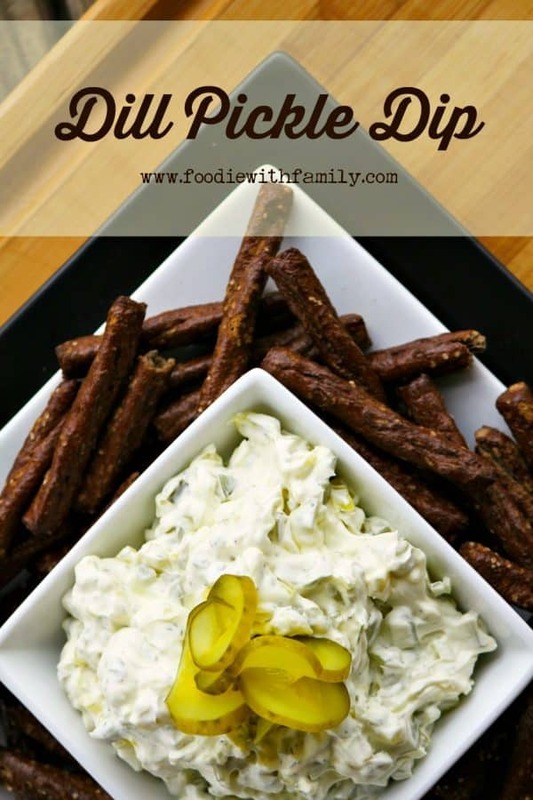 This dill pickle dip was a hit at my party this weekend! We served it as a dip but also on small “slider” style hamburgers with mini pretzel buns…….yum! Thank you for the great recipe. Do you have a preferred dill pickle for this recipe? Are ya talkin refrigerator style? Refrigerator style is AWESOME. Any garlic dill is my preference! I love your posts – I think your sense of humor is a riot – not to mention when I see your posts in my “in box” I sort of hope I WON’T like the recipe because nearly everything you post I want to save and I am plain running out of room on my computer. Cloud here I come. Will need to make this, my husband is the Pickle Freak. And oh, is this post an old one? All the above comments are dated 2012 yet YOUR post only came today. What’s up with that? You got me, too! I also love all things pickle (but really prefer dills)! Did you know that my grandmother (which of course was also the grandmother of my sister, the “other” Rebecca L.), made the BEST dill pickles in the world. No partiality here! I unfortunately, have not yet learned to can, but perhaps I will have to make the 500 mile trip to my sister’s to make some pickles with her….then drive home and make the dip. In the meantime, I guess store-bought will have to suffice. Thanks for a tasty recipe. I’m glad you “pushed” this older one today! Mmmmmm! 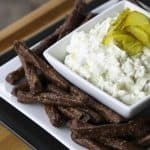 I never heard of pickle dip until my sister in law made the said pinterest dip you speak of. It is sooo good. I could eat sooo much of it. Um, I love pumpernickel and I need to buy some of these pretzels. I always think of the Vlassic stork (?) when thinking of pickles, that’s the greatest pickle I’ve ever heard! Well this dip my friend is the greatest pickle dip I will ever eat!!! Making it for Easter! I might have to make this for our Easter cookout! My main pickle lover won’t be there but I could save her some. In one of the old comments, somebody mentioned “The Pickle Guy” in Brooklyn. I had to laugh because I believe it’s the same “Pickle Guy” in the movie “Crossing Delancy” A GREAT MOVIE! I love your posts. I love getting my e-mails with a new post. I’m a total Pickle Monster too haha! When I got married, the first trip to grocery store resulted in my buying a huge gallon jar of dill pickles. When my husband asked why, I said “Because I’m a grown married adult now and I can.” bahaha. 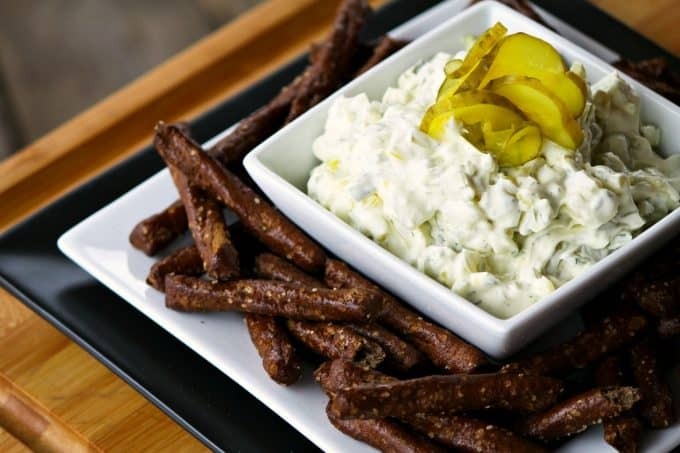 Looks like I need to go buy some more so that I can make this dip pickle dip. I could eat dip every single day! super tasty, and thanks for giving me a way to salvage a jar of pickles that i made two years ago – still tasty, but not too crunchy. they worked fine in the dip! This was a big hit at my card party! Everyone needed the recipe! So if you haven’t tried it…..you are missing out. I made this ay Christmas with Bubbies pickles, and wow- so good! I’ll definitely be making it again. And again. Thank you for sharing it! Thanks for weighing in on this one, Rhianon! Love those Bubbies pickles! Just made your dill pickle dip with homemade dill pickles from two years ago. Oh my….I did simmer them for about 15 minutes just to soothe my conscience. However, mine looked to have more pickles in it than your pictures. I added another 4 oz. of cream cheese just to make it creamier. Going to serve it to my Grands this weekend. Hope it is a hit! This dip is DIVINE! I used the entire jar of pickles, which when finely diced, yielded two full cups of chopped pickles. I used agar agar with the pickle juice to make pickle juice pearls and they were both a delicious extra pop of pickle and a pretty garnish for the top of the dip. Thank you for my new party staple! Excited to make Pickle dip! I couldn’t find Pumpernickel onion pretzels so I ordered it. I use full fat yogurt (strained) instead of cream cheese. It’s going to be Yummy!!! It is a perfect dip! I added all natural food grade dill oil! So yummy! Hi Dena! I’m so glad you enjoyed it! Just made this for a work potluck despite my family thinking I’m crazy. Glad I didn’t let them deter me. It’s yummy! This recipe just came across my Instragram feed with AllRecipes. I just made it and it is very good. Can’t wait for my daughter who is a pickle lover to taste it tomorrow. I used the Bubbies pickles. Thanks for another way to enjoy dill pickles!